In a recent post by GamerChris, he describes Hansa Teutonica as a "soulless Eurogame" but states that he still quite likes it (as do I). Well, Chris, if you want soulless Euro, have I got the game for you! 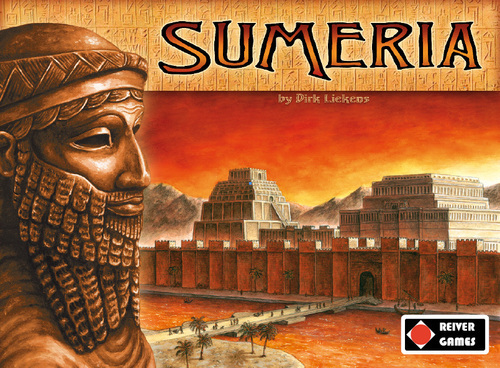 Reiver Games' Sumeria by Dirk Liekens is a cube-pushing, mind-numbing game of subtle, ineffective tactics that is about as dry as the desert it's board portrays. The rules themselves are pretty simple. Try to get a piece in the city of or a majority of your pieces in the top 3 of 8 regions by the end of each of the 6 rounds. Add a piece, remove a piece, or move and possibly jump a piece over others to get to another region. Every region you enter or remove a piece from usually changes the ranking of 2 of the 8 regions. And therein lies the problem. With each move from each player changing the ranking of the regions, often the top 3, it is nearly impossible to plan more than a turn or two ahead. And when one is the first player in the round with a set number of turns before scoring, it is almost guaranteed that the players after you will completely change the top 3 regions before you get to score. 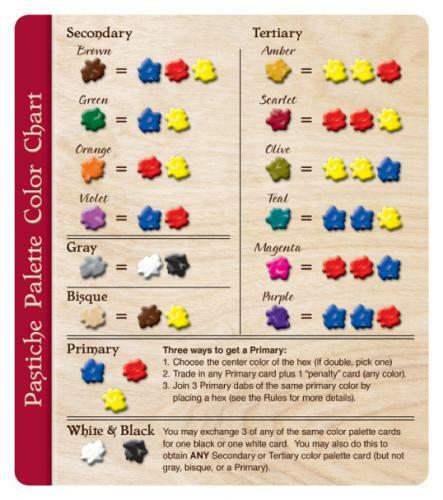 I suppose one could say the scoring mechanism is kinda neat, grabbing one or two of 4 different types of tiles which increase in value depending on how many you get (1, 3, 6, 10, etc...) But this is hardly original, having been done many times before in MUCH more interesting games like Knizia's brilliant Taj Mahal, for example. And since you barely have any control over what regions score anyways, it's impossible to plan to grab a certain tile over another. You just grab whatever tiles you are able to and the choice is pretty much thought-free. We played one 4-player round of this almost luck-free game and it gave us all a headache (but not in a good way). You can analyze and plan all you want, and we tried, but in the end you realize that everyone can completely destroy those plans in the turns between yours and the scoring. 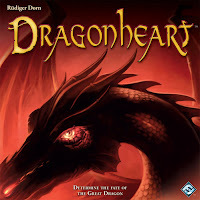 I suppose one would have more control in a game with 2 or 3 players, but to be honest, the mechanics of the game just aren't interesting or enough fun to be worth trying. 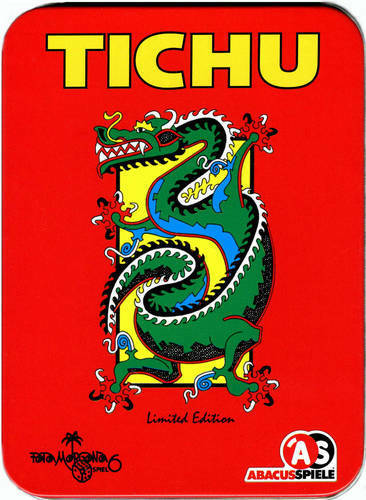 RELATED: At the same games night, we played Tigris & Euphrates, another Euro by Reiner Knizia. Every time I play T & E, I'm reminded of just how fantastic the game is. 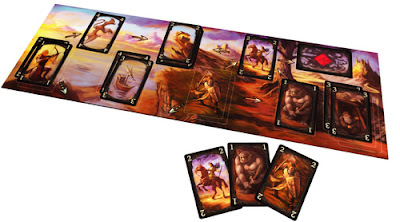 This abstract representation of civilization-building and conflict boils everything down to its bare essence and leaves a deep strategy that still feels thematic and is, most surprisingly, a hell of lot of fun. Easily in my Top 10 games of all time and proof that strategic Euros do not have to be dry and soulless. ...well, not really, but Tichu nights! The last couple weeks we've had 12-13 people over playing Tichu. It's been quite a lot of fun and we've already introduced some newbies to the game. In a couple weeks, we may have enough for four tables. I think we may need a bigger apartment. ASIDE: BGN points us to an well-written article about Eurogames in which Settlers is referred to as a 'Monopoly-killer'. Oh, if only. Many libraries across the world are celebrating National Gaming Day tomorrow Saturday, Nov. 13th. Check out the link here to see if your local library is having any events. There will be board games and video games galore, including many generously donated copies of the delightful Wits and Wagers thanks to North Star Games. Out of The Box Games, makers of the great "10 Days In..." series of games, also have a word game Word On The Street which I've heard good things about but have yet to play. They'll be having a championship for WOTS using an enormous 50 foot version of the game. Fun. If you're curious about what that looks like, see below. In fact, the first three plays - one right after the other right after the other. We just had to play one more game. If you like Lost Cities and/or you like Jaipur, you're pretty much guaranteed to like this game. What it loses in strategy compared to those two games, it gains in sheer speed of play and simplicity of explanation. Simply put, you play cards which can capture other cards which can also capture other cards... and so on and so on. Simple and delightful and another reason for my partner and I to turn off the TV and spend some more quality time together. 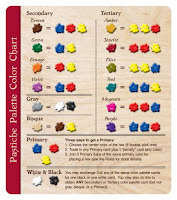 BGN announced the latest game in what seems like a new trend in game mechanics - "paint-mixing" (Fresco by Queen Games being the first, of course). Hmmmm. Well, I suppose it's a bit more thematic than "deck-building" or "worker-placement". 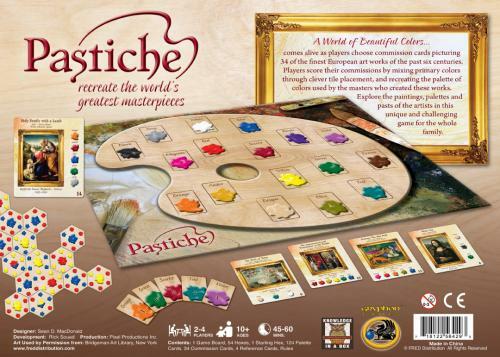 Unlike Fresco which is a worker-placement game with an element of paint mixing, the main idea of Pastiche is to mix colours together to come up with secondary and tertiary colours and use these colours to paint works of art. Ugh. The game actually sounds like it could be fun but if you're colour-blind like me, you realize the nightmare that THIS would cause. I was once seen wearing pink pants to class and I was totally oblivious. Turns out my favourite white pants had been washed with a red shirt.